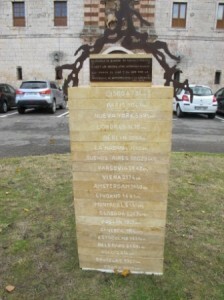 Susana Rioseras' "Roots of Memory," a memorial to the International Brigades at San Pedro de Cardeña. The inscription reads: "The people of Burgos, thanking the International Brigaders who gave their lives for the Republic, anti-fascism, and freedom. 1936-2011." The monument lists the distances to 20 international capitals. My name is Nancy Wallach. I am the daughter of Hy Wallach, an Abraham Lincoln Brigade Volunteer who was incarcerated in the concentration camp at San Pedro for almost 18 months. I wish to thank the International Brigades Commemoration Committee of San Pedro de Cardena for organizing this commemoration and giving me this opportunity to speak. I am especially moved that the Spanish people, many of whom suffered so greatly during the war and the subsequent years of the fascist dictatorship, are honoring the neglected heroes of the International Brigades. My father, along with other former prisoners, often spoke of the kindness and courage of the Spanish people they encountered, who even volunteered to take considerable personal risks to shelter them when they were trying to evade capture behind enemy lines. I just attended the 75th Anniversary conference in Barcelona, where they focused on the continued antifascist activities of the Volunteers after their return from Spain. The Lincoln Brigade members, including the former prisoners, overwhelmingly participated in all branches of the armed forces during WWII, in spite of the initial resistance of the US state department, who deemed them security risks as “premature antifascists.” One continual focus of the Veterans of the Abraham Lincoln Brigade was the plight of the pro Republican families and political prisoners during the post war years. They campaigned for their amnesty, tried to raise public awareness of the war crimes of Francoism, and their own government’s role in supporting him in exchange for American bases during the Cold War. In the late 1970’s, some of the former prisoners at San Pedro got to meet with the recently released Spanish prisoners, and went home determined to continue to work for the restoration of their full rights including the ability to hold civil service employment and receive pensions. Meeting these remarkable Spanish people was a highlight of their reunion. Thank you for reclaiming this chapter of the history of the Brigades at this commemoration at San Pedro. By doing so you are alerting people to the nature and dangers of fascism, just as the International Brigades did 75 years ago. Invariably, whenever people learn about the example of international solidarity shown by the IB’s on these first battlefields of WWII in Spain, they see the relevance for today’s current struggles. One of the most remarkable things about the history of the concentration camp at San Pedro de Cardena, is that in spite of the most brutal treatment, the IB prisoners never lost their humanity and compassion. While they had the distended bellies and skeletal physiques of hunger and starvation, they retained the dignity that came from having organized and even stood up to the harsh conditions. The same solidarity which propelled them to lay down their lives in Spain, also enabled them to publish the underground newspaper “The Jaily News” and to organize the “University” of San Pedro. While many other concentration camp survivors understandably put their horrendous experiences behind them in silence, the IBer’s at San Pedro are an exception. For example, my father often spoke about the amazing “curriculum” at the University of San Pedro. Although he may not have willingly chosen such a brutal setting or “campus”, at San Pedro he learned first hand of the struggles going on around the world from working class leaders such as the brave Frank Ryan, or the Yugoslavian partisan colonel Radivoy Nicolich. Fellow prisoners such as Max Parker, Moishe Tobman and Carl Geiser became life long friends and comrades in struggle. The prisoners at San Pedro showed the same heroism in the concentration camp as they did on the battlefields. When captured and questioned, they refused to let the fascists distort their reasons for volunteering to come to Spain, even at great risk to their own lives. By shining a light on their history today, you are keeping alive their example for future generations. In spite of the subsequent hardships, loss of life and even exile from their respective countries in some cases, the prisoners of the International Brigades at San Pedro left a legacy of inspiration not only to their immediate families, but for the entire family of man. Thank you for sharing,Nancy. This is a very moving speech. Thank you for a very intresting article! I don’t know if you remember but we met in Spain, you were kind enough to tell me about your father. Right now I am working on your intervieu, I would like to get in contact with you but I can’t find your card. My father who fought with the Mac Paps was jailed in Spain during 1938, he was released sometime in 1939. I learned this many years ago through a friend of his who was with him in Spain. I was not told where he was held, tho I know his treatment was horrid. Were there lists kept of prisoner names? Thanks for the article. My great-uncle served in the Lincoln Brigade and was held at San Pedro. He was one of the last to be released/exchanged. His name was William C. Stone. Nancy, I wonder if your father ever mentioned him. I was told by his half-brother that William never recovered from what he endured while in Spain. He died before I had a chance to talk to him about any of his experiences. I would like very much to write to you about San Pedro camp.